Through the winding labyrinthine of hallways and into the belly of a subterranean refuge at Western Avenue Studios, partners Peter Zimmerman and Aron Leaman are playing with fire. Glass blowing is an art form, born out of a centuries-old craft. And prior to Mill City Glass Works, there wasn’t a venue for creating glass art in Lowell. But thanks to a successful Indiegogo campaign, the artists raised more than $7,000 to install the furnace, kiln and supplies needed to make and teach the art locally. 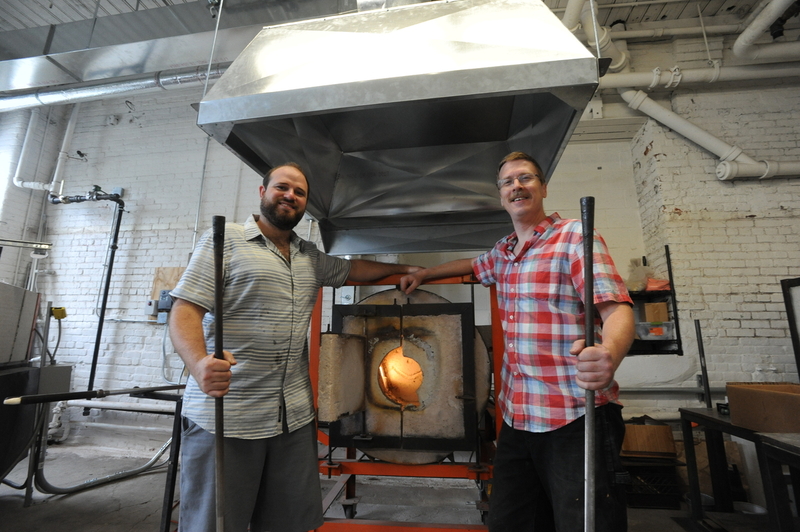 Whether they’re forging little trinkets, kitchenware, or other treasures, Zimmerman and Leaman share a passion for their craft that burns just as hot as their fire-fueled ovens. How did you first get into the art of glass blowing? Peter: I started with glass when I was going to school. I was a music major in college and I needed a part-time job. I was just looking for something that was two hours a day. I found out there was a glass blowing studio in town and I was fascinated by that. I kept watching the guy work and eventually decided I was really interested in glass; there was a very musical quality to it. I learned as an apprentice. This isn’t a job, it’s a lifestyle. You devote your life to it. To me it’s a marriage of this graceful dance, music and science. I feel like I use my whole brain. Aron: I started blowing glass when I was in high school. I always saw people blowing glass when I was younger, I’d sit and watch for hours. From there I found someone to take a few lessons from. I took the apprentice root as well. I’ve been doing my own thing for six years, selling my own work. What makes this type of art unique? Aron: As a material it’s like no other. You have those translucent qualities, those opacities. As a sculptural material, you can play with light. It adds a whole other element. Peter: My favorite thing about it is even though it’s as much of a struggle as it is to learn the design and skill, when you get through that, and you get to that tangible result and you find a gracefulness to it, I really love that. I have never experienced the same kind of frustration or just absolute rage that I couldn’t do something. But then suddenly something clicks after a little while. You’re only limited by your own imagination and your willingness to work to achieve those results. From left: Aron Leaman and Peter Zimmerman. What attracted you to pursing your art as a career? Aron: It wasn’t necessarily a decision that I made, it just sort of happened. I wanted to try it, and then I did and I didn’t go back. As a medium, glass is relatively immediate. Once you start a piece you have to see it through. The science, the intensity. It’s got a primal quality to it — man mastering fire. It’s everything that I’ve been interested in finding. What is the hardest part of your craft? Peter: It is so satisfying when you open that kiln and you see everything you made. What were your primary reasons for choosing Lowell over Boston to open a studio? Peter: Lowell is an emerging arts community. It’s just ripe. There are already glass blowing studios in Boston. Aron: There’s a nice raw space here; this is a nice size, and a little bit raw and dirty in a good way. It’s suitable. There’s a spirit that drives a good glass blowing studio. I think Lowell deserves a glass blowing studio. I like the idea of the old industrial space coming back to life. How did you feel when you successfully reached your fundraising goal of $6,000? Peter: That was very satisfying, I felt a sense of relief and I was really emotional about all of the support. It was a great start to the project; numbers have gone way up since then. Everything that we received went exactly for what we asked for, and we were able to do just a little bit more. 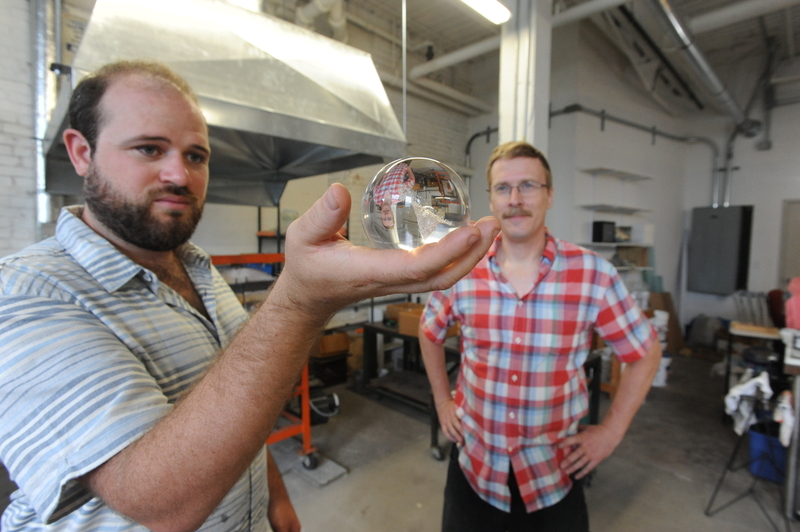 What does the future look like for Mill City Glassworks? Peter: Today Lowell, tomorrow the world. 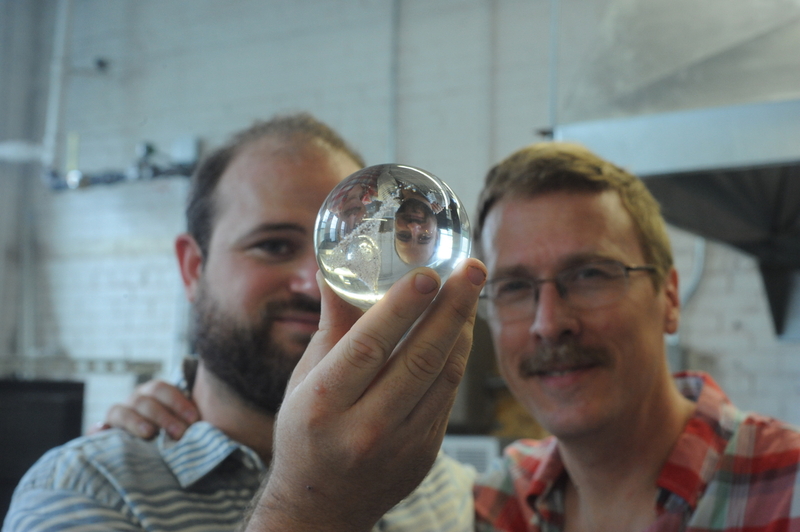 We want to get going, build a student base and show glass blowing to the Merrimack Valley. We would like to start working with the schools, create a buzz and an appreciation for glass, and bring back a little bit of that old factory style to Lowell. What types of classes/workshops will you offer? Aron: We have something for everybody. We offer quick little experiences, which are about 15-20 minutes, and those projects consist of paperweights, flowers, and hearts, that sort of thing. We also offer workshops, which are typically one to two days, and those focus on one specific skill or object. And finally we have classes, which are much longer, usually about six weeks, and those are much more in depth where we teach the basic fundamentals of glass blowing. 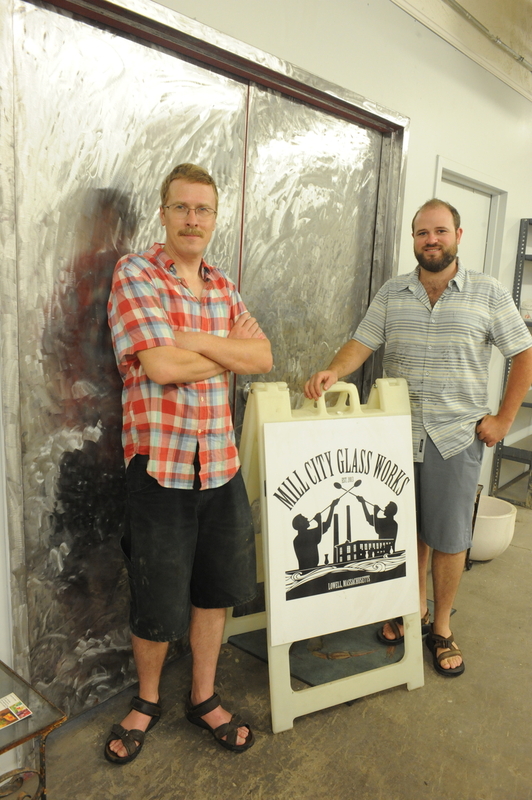 Check out Mill City Glass Works on the First Saturday of the month at Western Avenue Studios, 122 Western Avenue in Lowell, and follow their progress at millcityglassworks.com. 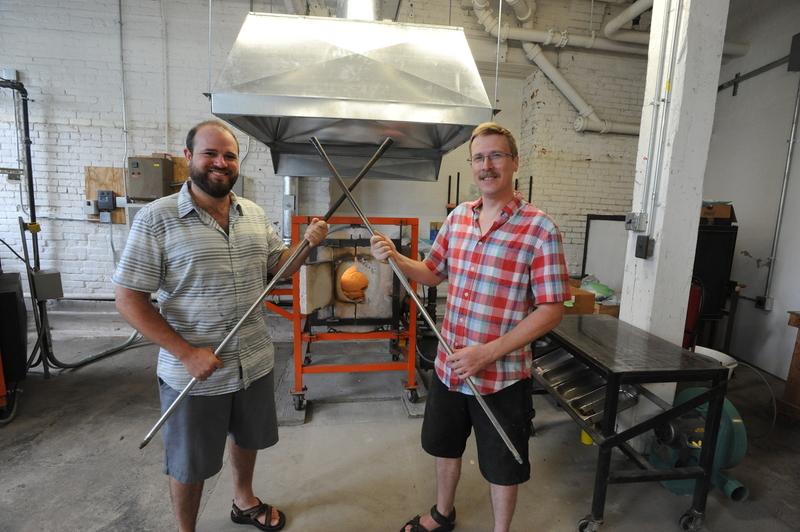 Glass blowing classes will begin this fall. Melissa Fedorchuk is a lifelong writer cultivated by UMass Lowell and all the local coffee shops. Half pop-culture nerd, half wannabe fashionista, Melissa keeps her wild-haired head in check by spoon feeding herself Disney GIFs and spending far too much money on books and clothes. When she doesn’t have her nose stuck in a Word document, she is obsessing over honey bees and reading as many YA novels as she can get her hands on.